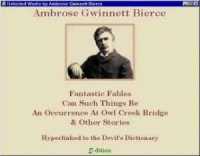 Ambrose Bierce was born on June 24, 1842 in Horse Cave Creek, Ohio; son of Marcus Aurelius and Laura Sherwood Bierce. He was the youngest of a large brood of children, whom Marcus, for reasons unknown, anointed with names beginning with A. Most of the stories above are hyperlinked, as much as possible, to the Devil's Dictionary. This feature provides a quick look at the meaning of a word according to Bierce. You can Search the whole e-book for a word or a sentence. Although we have a philosophy of saving paper, this e-book can print each page. You can also insert a bookmark to quickly go back to where you were at your last reading.